“Human trafficking takes many forms. Women and girls in particular are targeted again and again and again. We see brutal sexual exploitation, including forced prostitution, forced marriage and sexual slavery. We see the appalling trade in human organs. Let us also remember that modern manifestations of servitude may touch and even implicate us all. Trafficking involves the act of recruiting, transporting, transferring, harbouring or receiving a person through the use of force, coercion or other means, for the purpose of exploitation. Virtually every country in the world is affected by trafficking for sexual exploitation, forced labour, servitude, and removal of organs as a country of origin, transit or destination. Every year, thousands of men, women and children fall into the hands of traffickers, in their home countries and abroad. The Regional Support Office of the Bali Process (RSO) was established in 2012 to operationalize the Bali Process’ Regional Cooperation Framework (RCF) to reduce irregular migration in the Asia-Pacific region. Drawing on the engagement created among the Bali Process Member States on issues related to countre Trafficking, the RSO supports practical cooperation on refugee protection and international migration, including human trafficking and smuggling. Its activities are supported by the knowledge, expertise, and experience of Member States and international organisations, including IOM and the UNHCR. · Promote information sharing and exchange of best practices between central/provincial governments and NGOs/local actors. · be able to build professional networks, exchange information and knowledge. 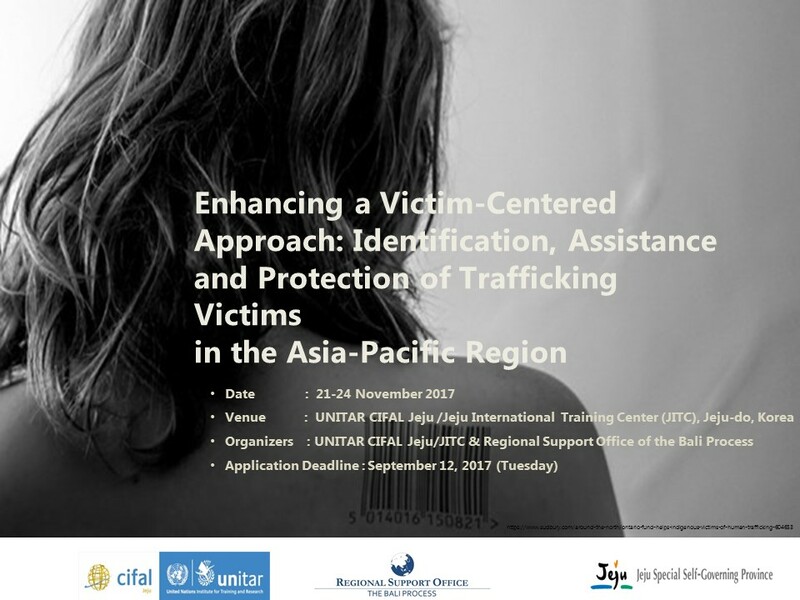 This training is open to local government officials and other related personnel from NGOs and institutions who directly work with the victims of trafficking. · Local expenses (transportation, accommodation and meals) during the workshop will be covered by UNITAR CIFAL Jeju/JITC except for arrival and departure days. · All other expenses (local transportation in their country, visa fee) are the responsibility of the participants.